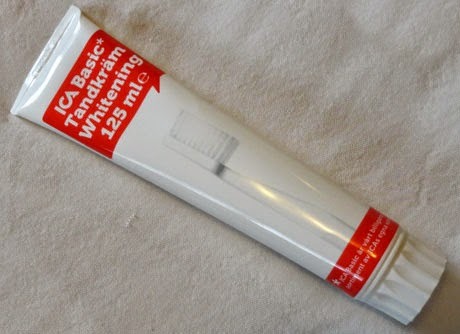 This lovely basic toothpaste is from ICA of Sweden. Think IKEA. (No, they don't sell toothpaste, at least in any store I've visited in the USA.) Think clean and simple design. Functional yet pleasing to the eye - or in this case, the mouth. As white toothpastes go, this is one that will offend no one. The taste is a little less sweet than your average white minty paste from the States. And it has no hint of wanting to jump down your throat with ultra-bold flavor, like some toothpastes. I like the fact that it has flouride. I can brush with no guilt - or at least with no feeling that my teeth will be less healthy in the long run. This is the first guest post on The International Toothpaste Museum. Due to the hassles of international mail, my friend Josh did not send this one to me but rather shared it with me digitally. Colgate of India produces a salt toothpaste for African consumption. (Josh lives in Nairobi, Kenya, where I met him and shared some fun experiences together.) Interestingly, the packaging is primarily in French, which is the trade language of many countries in West Africa. Touted benefits include that it is "AntiGerm" - it "reduces germs and cleanses teeth and gums." And, "with regular brushing, [it] gives you healthy teeth and gums." In America, these benefits are assumed and will rarely be seen on toothpaste packaging. Josh provided this description: "It isn't bad. Tastes like slightly salty toothpaste. I guess slightly minty and salty. I might even prefer it slightly more salty." Regular visitors to this website know that international toothpastes provide a glimpse into how global cultures relate. Although I am American, I think it's fair to say that many cultures follow trends started by the USA and England. One small evidence is Splat toothpaste. Although Russian is the primary language and Russia is the primary market for this toothpaste, English is the second language featured in the packaging and website for this toothpaste. And the slogan is in English, even on their entirely Russian website: "Professional oral care" - as well as their marketing phrase: "Idea. Quality. Result." Miswak is maybe the most ancient method of brushing teeth. It's a twig that makes a passable toothbrush, when prepared properly. Wikipedia has a great entry on miswak, detailing the history and use of the plant. Muhammad used miswak regularly, and it's even mentioned in the Hadith, Muslim holy writings. Sadly, I did not feel holy when brushing with this toothpaste. Dabur is a giant corporation based in India with products distributed all over the world. I've enjoyed several of their pastes before, and none have been a disappointment. 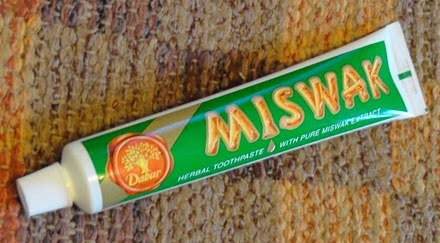 This Miswak toothpaste is a natural white color with a lovely anise flavor. As is the norm for most "healthy" toothpastes, there is no flouride added. The most fun aspect of the package is the 1950s Americana wood typeface logo. I'm not sure what the designer was thinking, but I like it. I searched in vain for other logos with that kind of type treatment. However, I did find a free log typeface for your publishing pleasure.